This is not how I wanted to introduce or discuss my friend’s and loyal supporter’s, April Brown’s, upcoming book “Poetic Justice”. However, an unexpected turn of events began January 7, 2015 when I was notified that my alleged “stalkee”, Linda Ellis of Dash Poem fame, had become an “online stalker of sorts” of April Brown. 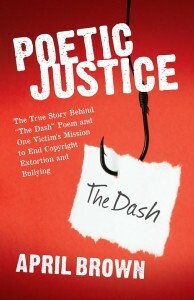 Unlike my case, where all of my flamboyant, controversial (and occasionally outrageous) commentary about the Dash Poet, Linda Ellis, was posted entirely on my own website, ExtortionLetterInfo.com (ELI) for MY audience and readership to read which led Ms. Ellis’ to pursue a “stalking protective order” against me. Today, we now find that that the alleged “stalkee” has become April Brown’s “stalker”. It was brought to my attention that Ms. Ellis made a blog post on what appears to be a new website lindalogic.com entitled “Obsession”. Because of her well-known propensity to first post knee-jerk comments then late retract them or edit them only a short time later, I felt it wise to make a few screen captures. After all, in her case against me, she and her “wonderfully brilliant” lawyer, Elizabeth W. McBride, used intentionally-bastardized screenshots (incomplete, out-of-context, highly-selective, blocked out sections) to build a case against me. However, I need not stoop to that level. I am perfectly comfortable keeping everything in context in discussing Ms. Ellis’ current “stalking” of April Brown. April Brown is a woman I “met” initially through Twitter in early 2012. To make a long story short, April and I first became acquaintances. 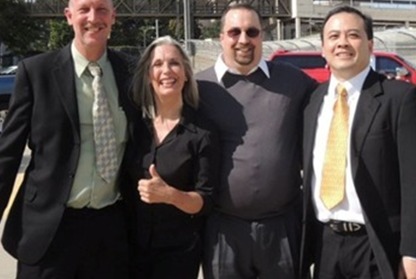 But over time we developed a sense of camaraderie, mutual respect, and friendship especially when ELI and I became drawn into legal battle against Ms. Ellis in early 2013 where I was compelled to defend myself against her ridiculous stalking accusations. While I am not going sidetrack by detailing what transpired in the courtroom, (suffice it to say, that it was extremely beneficial for Ms. Ellis to portray herself as a tearful, middle-aged mother who was allegedly “protecting” her adult daughter and intellectual property in front of a local judge who show no little or no interest or knowledge of Section 230 of the CDA or even the First Amendment as it relates to Internet speech). In a swift 10-minute “quiet and thoughtful” decision-making process by the judge, Ms. Ellis got herself a PERMANENT (lifetime) protective order against me which would have been fine with me EXCEPT that the genius of Elizabeth W. McBride (and legal super-heroine) wanted to take advantage of my non-lawyer status by adding two paragraphs in the protective order that directed me to wipe away nearly 2,000 other non-threatening, informative commentary and posts (many of which I did not write) from ELI AND to forbid me from ever speaking ABOUT Ms. Ellis ever again on my own website! Suffice it to say, the apparent conspiracy between Columbus attorney Elizabeth W. McBride and the local judge essentially guaranteed I was going to file an appeal but I was going to have break out the “big guns” in the form of my friend, business associate, and lawyer, Oscar Michelen (who without my asking volunteered his legal expertise on my behalf) in addition to William J. McKenney. Ms. Ellis in her inimitable, hypocritical, self-righteous style and her alleged “fear” of me managed to coax out two distorted media stories against me by PDN and Marietta Daily Journal that actually said I was a “cult leader”. However, it didn’t take long for us to rebut those ridiculous stories in the form of our own media coverage from Ars Technica, TechDirt, EFF, DMLP, etc. who saw the truth of the over-reaching protective order as outright violations of Section 230 of the CDA as well as my free speech rights. You can find the list of “our” media coverage here. 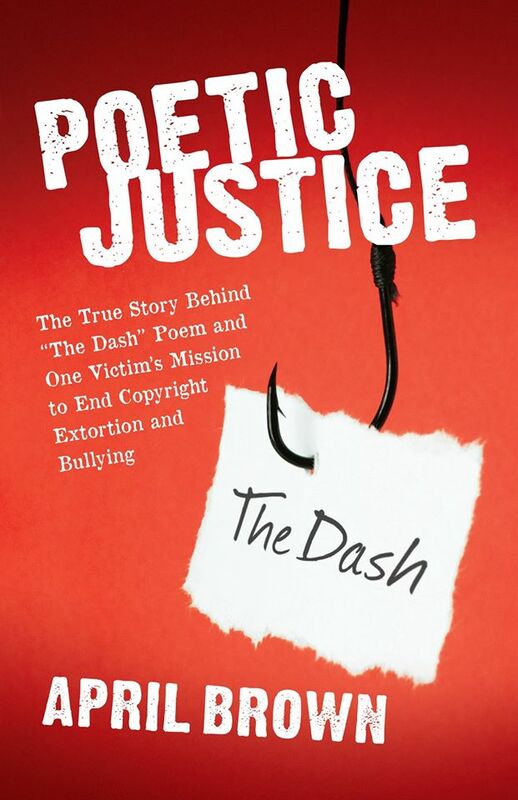 The reason I summarize my story is that it is now ironic for me to watch Ms. Ellis seemingly chase April Brown around the Internet and directly, actively posting on April’s websites and social media accounts that discuss April’s upcoming book, “Poetic Justice”. “Poetic Justice” is April’s behind-the-scenes telling and recounting of her personal journey as a result of becoming Ms. Ellis first, very outspoken, sassy, and passionate extortion letter victim. To the best of my knowledge, no other extortion letter victim has ever responded and fought back against Ms. Ellis as loudly and vocally as April. Additionally, scores of extortion letter victims since 2012 have turned to April who has freely given of her time, energy, and knowledge to educate others on how the Dash Poem Extortion Letter operation works which includes her pudgy and follically-challenged co-hort. John W. Jolin. April Brown needs no one to defend her but I do so because Ms. Ellis continues to attempt to “tarnish” the reputations of people like April who are my friends, business associates, supporters, and allies of me, ELI, Section 230 CDA, and the First Amendment by tying the overreaching stalking protective order and underhandedly and misleadingly implying that I am a criminally-convicted stalker serving some punishment. Rest assured, that isn’t even close to being true. I have been free to go about my business since the protective order was issued and the whole legal incident has become a gift and lifted the ELI Community, website, and everyone associated with it in ways we could never have foreseen. It has brought us into contact with media, activists, and legal scholars I never could have met on my own. Win, lose, or draw, it has been a great life experience and a greatly unifying event for everyone involved. As I see it, April Brown has the right to write and publish her own book “Poetic Justice” about her life experiences as a consequence of Ms. Ellis’ instigated actions. This has entirely been April’s brainchild. However, as a self-publisher, I was happy to give counsel and advice to April as she occasionally requested. While I am not April’s book publisher, I have made every effort to communicate and convey to April the necessity to be as accurate as possible and to be clear about what is fact and what is her opinion. She has hired a number of editors to re-read and critique her book. April has a right to express her opinions about Ms. Ellis, her copyright extortion operation, and the people who assist her. It now appears that Ms. Ellis is conducting a one-woman campaign to dissuade and discourage April from releasing her book. This is quite ironic given the fact that Ms. Ellis has used her website justfreespeech.com to “motivate” and “encourage” April to rethink her plans to release the book by making veiled threats to publish potentially unflattering information about April. However, April, as long as I have known her, has never tried to make herself out to be a perfect human being. April is a smart, determined, passionate, creative, unorthodox, outspoken, no-nonsense business woman that takes no prisoners when provoked and attacked. She is extremely loyal and supportive to those she considers her friends. I relate to her and understand her on all of these characteristics. Nevertheless in her new book, April expresses her disapproval and disdain for Ms. Ellis, her poem, and most of all, her copyright extortion operation. APRIL: As you read this and copy, paste and twist whatever sentences best fit your lies, know that in my heart I feel nothing but empathy for you. Your actions have done more good than the harm you’d intended as I am now focused on helping other stalking victims. I continue to pray that God will bless you with something in your life important that you can focus your energy toward, something that will enable you to devote the time you have left on earth to loving, positive things. Ms. Ellis has conveniently “lifted” a photo that I own and displayed that image on her website. The good news for her is that she chose a nice-looking, flattering photo of me, my friends, and business associates. To the best of my knowledge, everyone in the photo is comfortable with it and have no problems being “shown off” to the world. Incidentally, the photo was taken in Atlanta on October 7, 2014 after the oral argument session at the Georgia Supreme Court. I supposed if I felt motivated, I could have my lawyer send her a $7,500 extortion letter to see how she would respond to it. Personally, I like that we are happy people fighting the good fight against copyright extortionists. Many people love us for it. The thanks and gratitude we receive from extortion letter victims is ongoing. Matthew I will always be your biggest fan. People have no idea how much hard work and dedication goes into ending copyright extortion. We may not have a bank full of money like the copyright trolls do, but we have a bank full of hearts and minds. You are a true warrior and a beloved friend.